Any updates on the Drum? Sorry for the delay in getting back here.... Alright some how the walls are pinching the rounds enough I assume to cause the problem. I can't just drop a round and it not remotely get stuck and need to be forced out. Just out of curiosity I pulled out my VEPR 12 mags. I have the factory 5 and a SGM?10RD. Took the spring and followers out and sure enough the rounds slide smooth all the way through. So with minimal time I have began trying the technique you had mentioned by widening the walls towards the back of the mag and it seems to be helping. As far as the follow it seems to drag but just by the BHO catch of the rear the sides seem to clear fine. I think this process will get what I need done. I will have more time this weekend to get to work on it and see how it continues to go. Thanks everyone for the tips. Looks like if it continues as planned I will be getting with Salem for their adapters to make them 10RD's. Again thanks everyone for the help here, very much appreciated!! The best I can tell is earlier this year I ordered an MKA 1919. Both the factory 5rd mags that it came with won't feed properly. I have searched for similar issues but have not been able to find anything to help me. So I ask you what can I do or should I do if anything. Luckily my gun seems to function and cycle through low brass and high without any issue for the most part. However the magazine will fail to feed if you will. As in it will load a round eject go to load another but the next round isn't coming up to the top of the mag. The best way I can describe it is the walls of the magazine are pinching the follower or ammo. The best I can tell the walls of the mag aren't crushed or pressed in that I can tell.... Maybe not a strong enough spring? Its getting frustrating. I had planned on buying Salem 6's 10rd upgrade kit, however am I wasting my money if my 5 isn't working. Then I thought maybe buy Tooth and Nails follower's maybe thats my problem. Then I figured maybe best bet is to just start over with 2 new factory 10rd mags. Any suggestions would be great just don't want to waste money here I have put in a lot already to just waste any. I will be able to work on this over the weekend so any help would be great. It will have me further along then I am right now. Thanks in advance if anyone can chime in. Also side note I've tried storing the mags loaded. As well as just unloading by hand still the rounds will hang in the mag at some point. A simple slap of the wall of the mag to the hand moves the rounds up into position. This is driving me nuts!! NoLimit replied to NoLimit's topic in General Discussion - Any topic is welcome here!!! Thanks guys great to hear opinions when I say money is tight. I mean too tight to drop 1300+ on a solid AR10. As far as .308 I know its not cheap but I can handle a box here or there to start a small stock pile every other week. Glad to hear the opinions there for a minute I didn't think anyone would respond. So again thanks guys. NoLimit posted a topic in General Discussion - Any topic is welcome here!!! Alright I'm getting into a gun trade and would like everyones opinion. What I have: saiga 12 19" IZ109 new out of the box only shot 20+ RDS to test cycle and function. Worked flawless, gas ports seem great. All stock no extras. Also have in the trade. A Windham weaponry ar15 flat top with 2 30rd mags, 1 42rd mag, red dot, and 500RDS. Other person has: Rock River Arms - operator AR10 308 painted white with digital cammo professionally done. With scope and 5 mags. I think its a 20" and I'm unsure of scope maker it is a 6-24x40 tho. The person value's this all at $2500.00 Keep in mind I want a AR10. I just don't have the funds. So what do you think smart or not? Aye, since you asked - my local Cabela's has the same gun for $550 new. Cheaper with a black finish. Was it the same gun the 3" chamber and 3" Barrel...I beleive it is the Magnum Judge with it being the 3" so it will shoot both 3" and 2 3/4 shells. Also was it the Cabela's Judge Bulldog Package??? I am lowering the price for a short time for anyone interested PM me I am in huge need of money right now. Check the pices above. If still no offers in a few days I will just cancel the listing here and prepare for the gun show coming next month. Thanks everyone. Any offers at all? The prices cant be too high I have looked at several places to check unless I want to give them away. If more pictures are wanted just ask. Thanks everyone! I would like to start by saying that I am selling these guns only because I am in need of funds to get a few things for my new truck I am interested. All 3 guns have maybe 300-400 rounds each. For now I will give a breif description of each the best I can and show actual current photo's of what each gun comes with. I am going to try and have that done tomorrow for now if you would like you can see them in my albums. I will only ship to a FFL dealer from my FFL dealer after funds have cleared. The three guns are listed below.They are also all about 1 year to a 1.5 years old. Everything to me show light wear but other wise is still like new. No major Damage and all 3 function as they should without any problems. Again I am only selling to buy parts for my truck If I was not in need for those parts they would not be for sell. 1. Saiga .223 IZH-114 Purchased through K-VAR. This gun has been converted with parts purchased from Carolina Shooters Supply and those parts are, Conversion Kit #2 adjustable stock (different grip see picture when I add them), UTG Rail with 15 ruber cover peices, and SGM 30 RD mag. Factory 10 RD mag, Double side mount rail, and Simmons 3-9X32 scope are also included. PRICE:$625.00 + Shipping and your FFL Cost. OBO 2. PT 24/7 PRO DS 9mm Pistol. This is a uniqu two tone type color/finish gun. Again pictures will be provided tomorrow when I have more time but you can see this gun in my albums. This gun comes with 2 magazines 17 rd capacity, comes in case it was purchased in, 2 saftey lock keys, cleaning peices, and holster that holds the gun as well as the extra mag. PRICE:$325.00 + Shipping and your FFL Cost. OBO 3. 3" Taurus Judge 3" Chamber .45lc/.410 Bulldog Case and Holster complete Package. Stainless Finish very nice and fun to shoot gun! This gun also comes with the 2 safety lock keys as well as a cleaning brush I have that still in like new shape. PRICE:$550.00 + Shipping and your FFL Cost. OBO *****IF YOU LIVE IN NORTH TEXAS AND WE CAN MEET IN PERSON IF THAT CAN BE DONE NOT SURE. BUT I HAVE ABOUT 160 RD 62GR HP FOR THE .223, AND 50 RD HP .45LC AND A FEW BOXES OF FEDERAL .410 FOR THE JUDGE***** Any questions about the items I have just ask I will answer them the best I can with what I know. Again I will have exact pictures available tomorrow. If there is a need for more pictures or something specific you want to see in the picture just ask I will do the best I can to do what I can for you. thanks everyone hope this helps me out. I want to say that both the pistols are possible sold just waiting on payment confirmation I will update when that is 100% . Thanks again. 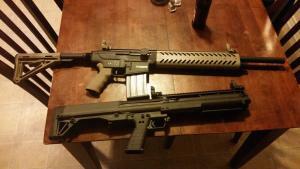 If you interested in the Saiga .223 I will throw in the old parts that were removed I still have everything. Thanks IF YOUR INTERESTED PM ME PLEASE! Yeah I didn't think I could ever go wrong with HP rounds. Just got to thinking and wasn't sure about the 62GR. I think my S12 is a Arsenal but my .223 is not either way sure hope they get off their butts I need that ammo by this weekend! I wish I could have ordered everything I got from the same company but I unfortunately had to go through 3 different companies to get my order in. Thanks for the info Koljec! Conversion tool longer then expected but boy she looks SWEET! When i got home opened up the box and noticed I got a free upgraded pistol grip!. Not bad at all I must say it looks pretty damn good. Added on front rail system too. Now if I could sell my Martin Sabre bow and supply's I could buy more stuff! lol Thought I could add a picture in here but cant figure it out. Ill post a picture up in my gallery. I did the s12 conversion about a month ago. My .223 kit looks to be out for delivery so I will have a lot of fun this afternoon with the new conversion. I can't wait. Will update the process this evening! Well thanks for the info but after what I read else where on this 100 rd mag being junk I think ill pass I can buy a lot of ammo and extra 30 rd mgs for 200.00 that I know will work fine. Just thought it would be sweet to have my wasr-10 w/ 75rd drum, saiga 12 md-20 drum, and the new saiga 223 with a 100rd. I guess ill have to do some research but after reading that one post sure did scare me away.